The Kawanishi H6K was an Imperial Japanese Navy flying boat produced by the Kawanishi Aircraft Company and used during World War II for maritime patrol duties. The Allied reporting name for the type was Mavis; the Navy designation was "Type 97 Large Flying Boat" (九七式大型飛行艇). 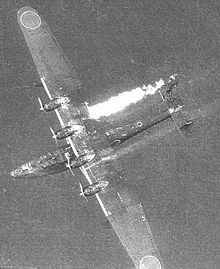 An H6K suffering from a wing tank fire descending. The aircraft was designed in response to a Navy requirement of 1934 for a long range flying boat and incorporated knowledge gleaned by a Kawanishi team that visited the Short Brothers factory in the UK, at that time one of the world's leading producers of flying boats, and from building the Kawanishi H3K, a license-built, enlarged version of the Short Rangoon. 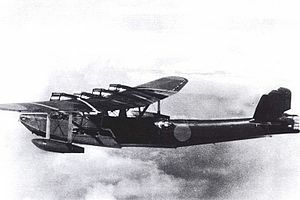 The "Type S", as Kawanishi called it, was a large, four-engine monoplane with twin tails, and a hull suspended beneath the parasol wing by a network of struts. Three prototypes were constructed, each one making gradual refinements to the machine's handling both in the water and in the air, and finally fitting more powerful engines. The first of these flew on 14 July 1936 and was originally designated Navy Type 97 Flying Boat, later H6K. Eventually, 217 would be built. H6Ks were deployed from 1938 onwards, first seeing service in the Sino-Japanese War and were in widespread use by the time the full-scale Pacific War erupted, in 1942. At that time of the war, four Kōkūtai (air groups) operated a total of 66 H6K4s. The type had some success over South East Asia and the South West Pacific. H6Ks had excellent endurance, being able to undertake 24-hour patrols, and were often used for long-range reconnaissance and bombing missions. From bases in the Dutch East Indies, they were able to undertake missions over a large portion of Australia. However, the H6K became vulnerable to a newer generation of heavier armed and faster fighters. It continued in service throughout the war, in areas where the risk of interception was low. In front-line service, it was replaced by the Kawanishi H8K. Evaluation prototypes with four Nakajima Hikari 2 engines, four built. First production model. Includes two H6K2-L officer transport modification, 10 built. Major production version, modified H6K2 with revised weapons, some with 694 kW (930 hp) Mitsubishi Kinsei 46 engines. Fuel capacity increased from 7,764 L (1,708 Imp gal) to 13,410 L (2,950 Imp gal). Includes two H6K4-L transport versions, 100 to 127 (if other numbers are all correct) built. Air Service Volunteer Corps - A single H6K5 flying boat was restored to flight by Indonesian forces during the Indonesian War of Independence. ^ Francillon 1979, p. 307. ^ Air International & December 1985, p. 294. ^ a b Green 1972, p. 129. ^ a b Green 1972, p. 128. ^ Air Enthusiast Quarterley 1976, p. 156. ^ Francillon 1979, p. 306. Doubilet, David. "The Flying Boat". Sport Diver Magazine. Volume 15, Number 8, September 2007. Francillon, Ph.D., René J. Japanese Aircraft of the Pacific War. Annapolis, Maryland, MD: Naval Institute Press, 1995. Green, William. Warplanes of the Second World War, Volume Five: Flying Boats. London: Macdonald & Co.(Publishers) Ltd., 1962. ISBN 0-356-01449-5. "Kawanishi's Parasol Patroller". Air International, December 1985, Volume 29, No. 6. Bromley, UK: Fine Scroll. pp. 293–298, 304-305. "Pentagon Over The Islands...The Thirty Year History of Indonesian Military Aviation". Air Enthusiast Quarterly. No. 2, 1976. pp. 154–162. Van der Klaauw, Bart. Water- en Transportvliegtuigen Wereldoorlog II (in Dutch). Alkmaar, the Netherlands: Uitgeverij de Alk. ISBN 90-6013-677-2. Wikimedia Commons has media related to Kawanishi H6K. This page was last edited on 20 February 2019, at 14:56 (UTC).